Does the circadian clock affect your ability to adapt to winter cold? In press for Molecular Metabolism. My contribution to this paper is very limited, but our collaborators in Urs Albrecht laboratory made a very nice advance in understanding how the circadian and thermogenic pathways intersect on a molecular level by demonstrating a clear molecular defect in adaptive thermogenesis in mice lacking the core clock activator gene Per2. 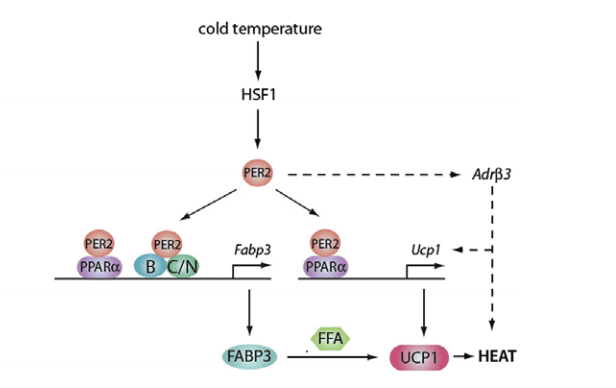 The underlying proposed model, is that in the brown adipose tissue, nuclear Per2 may interact with PPARa and control thermogenic protein Ucp1 expression, therefore orchestrating adaptive thermogenesis. In addition, the study also shows that mice can adapt to the cold only if kept in low-humidity conditions (winter time). In summer time / high humidity, Per2 expression is lower and mice cannot adapt to cold, pointing to the amazing possibility that Per2 may also have a role in seasonal adaptation, a novel, unexplored and stimulating research direction that remains to be demonstrated. Adaptive thermogenesis allows mammals to resist to cold. For instance, in brown adipose tissue (BAT) the facultative uncoupling of the proton gradient from ATP synthesis in mitochondria is used to generate systemic heat. However, this system necessitates an increase of the Uncoupling protein 1 (Ucp1) and its activation by free fatty acids. Here we show that mice without functional Period2 (Per2) were cold sensitive because their adaptive thermogenesis system was less efficient. Upon cold-exposure, Heat shock factor 1 (HSF1) induced Per2 in the BAT. Subsequently, PER2 as a co-activator of PPARα increased expression of Ucp1. PER2 also increased Fatty acid binding protein 3 (Fabp3), a protein important to transport free fatty acids from the plasma to mitochondria to activate UCP1. Hence, in BAT PER2 is important for the coordination of the molecular response of mice exposed to cold by synchronizing UCP1 expression and its activation. Molecular Metabolism is a new open access journal, they have a very unique 72h/72h policy: it means that if they are interested in your manuscript, they guarantee a peer-reviewed reply in 72 hours after submission. Then, you also have 72 hours to reply to the referee, which makes a fast-track publication. By the way, I really like the Molecular Metabolism editorial strategy, basically, they contemplate only minor revisions and referees cannot suggest considerable further work required to reach the exhaustive degree of conceptual advance that is normally required to kill a couple of PhD students. 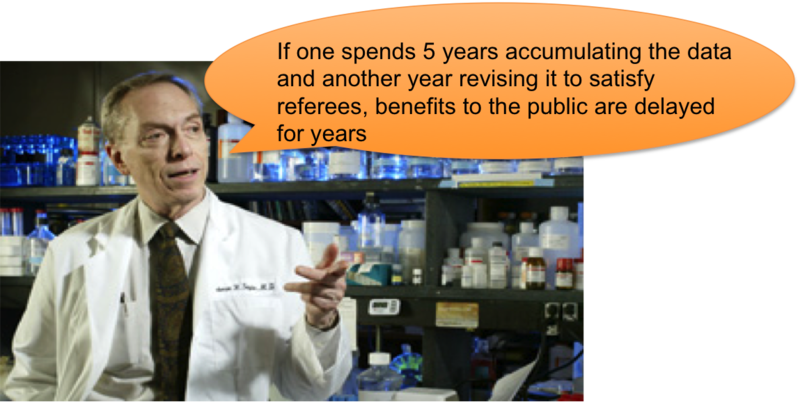 Conversely, editors at Molecular Metabolism welcome young scientists to consider what is a minimal publishable unit and ask reviewers to evaluate what is adequate vs exhaustive documentation to support the major thesis. As a result, breakthrough observations can be communicated faster and in a form in which they are much more plastic and usable, ready to stimulate other scientists' work and receive more comments in post-publication peer reviews. In fact, it's more fun to discuss real-time evolving concepts rather than to digest monumentally established pieces of evidence. That's why I think Molecular Metabolism perfectly adresses the points argued by Solomon Snyder in recent a PNAS editorial and thus it is the perfect venue for the study of our collaborators.